Stampin' Up! UK Demonstrator - Teri Pocock: Last Day For 2 FREE Stamp Sets!!!! If you have been thinking of joining Stampin' Up!, don't miss out ...... you only have until about 10:45pm (UK time) to take advantage of this offer! The Starter Kit is amazing value already - you get to choose £130 worth of product for just £99. You also get a free business pack which includes catalogues, order forms etc. 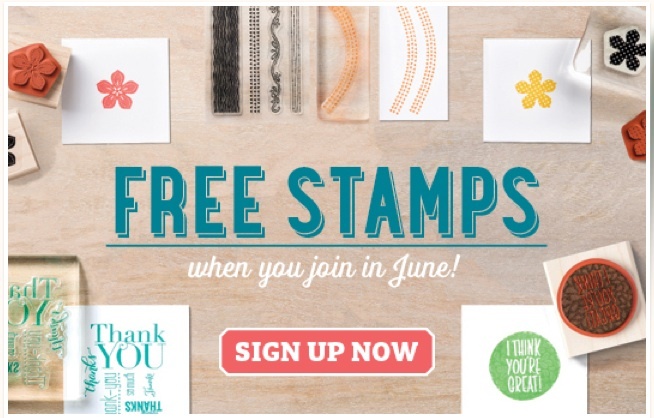 During June only .... you will also get to choose a further 2 stamp sets from the catalogue!!! There are no value restrictions, so you can choose whichever sets you want! Do you need more information? ..... click on the Join My Team tab at the top of this blog and have a read. I would love to welcome you to my Team - whether you just want to buy for yourself and get a fabulous discount - or if you want to start your own business!